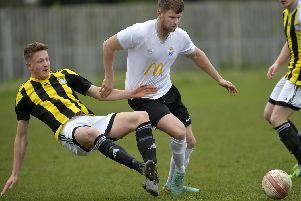 Horsham YMCA eased to a 4-0 victory over basement-side Eastbourne United on Saturday to maintain their two point lead at the top of the SCFL Premier Division. Picture by Jon Rigby. Horsham YMCA boss Peter Buckland was pleased his side bounced back from a midweek defeat with a convincing 4-0 away win over Eastbourne United in the Premier Division on Saturday. YM were beaten 3-2 away from home by Saltdean United on Tuesday but Buckland’s side put that performance behind them to remain top of the league. Horsham YMCA celebrate as Dan Mobsby puts the visitors 2-0 up. Picture by Jon Rigby. The visitors hit three first half goal in 20 minutes as Dean Bown, Dan Mobsby, and Tom Gilbert put YM 3-0 up at half-time before Bown bagged his second ten minutes after the break to seal the victory. Buckland was pleased with the manner of the win in a game that he felt could have been a potential banana skin. He said: “It was a clockwork performance. I said let’s get the game won by half-time so we don’t have to exert too much energy and that’s pretty much what happened. “We were 3-0 up at half-time and then we scored another goal and we should have probably have had another two. Horsham YMCA boss Peter Buckland and his assistant Julian Miller watch on. Picture by Jon Rigby. “It was imperative that we hit the ground running because, and you see this at all levels of football, a team may be struggling at the bottom but at some point they will win a game and at some point it will probably be at home. “There were a few things that could have gone against us so I said let’s get this won by half-time and then we can relax a bit. YM took the lead on 15 minutes as the in-form Bown headed home to net his tenth goal of the season, and the lead was doubled quarter of an hour later as Mobsby placed his shot beautifully in the top corner of the net. Action from Horsham YMCA's convincing 4-0 away win over Eastbourne United. Picture by Jon Rigby. On 35 minutes, Gilbert bagged his first goal of the campaign to put YM in a commanding position at 3-0 before the end of the half. After the half-time break it took YM just ten minutes to get the fourth as Mark Cave found Bown who finished superbly to pick up his eleventh goal of the season. The visitors did have further opportunities as Alex Barbary and substitute Sam Schaaf missed two clear cut chances but the score remained 4-0 at the full-time whistle. He added: “We got Gedling through 90 minutes and he was chosen as man of the match, and for his first 90 minutes of the season that was great. Horsham YMCA host Lancing in the league on Saturday. Horsham YMCA: Jeal, Carden, Harding, Gilbert, Donaghey (Gill), Gedling, Bown (Brown), Mobsby, Garrod. Cave, Barbary (Schaaf). Unused: Evans, Moore.